Yale School of Music - M.Mus. Alex’s musical life began early, fostered by his family, all of whom were active participants in the music and theater scenes of his hometown, Jamestown, New York. Still, it came as a surprise when he could be heard singing difficult chromatic melodies from "Phantom of the Opera" at age 4. When a 10-year-old Alex demanded that he start learning to play the electric bass, his mother, a pianist herself, insisted he also start piano as a part of his musical training. In addition to these two instruments, he went on to study alto, tenor and baritone saxophones, guitar, cello, viola, tuba, and joined the school choir. Alex was 14 years old when he finally shook hands with the double bass. Alex has studied with world-renowned musicians. With degrees from the State University of NY at Fredonia and the Yale School of Music, and having served as Performer in Residence at Carnegie Mellon University, his teachers include Micah Howard, Harry Jacobson, Donald Palma, and Jeffrey Turner on classical bass, and Jay Haser on jazz electric bass, and he has performed in master classes for many other world renowned orchestral and solo bassists. Alex was also the first double bassist in the school's history to be awarded the SUNY Fredonia Performer's Certificate. Orchestral performance is one of the highlights of Alex's career. He has performed as principal, assistant principal, substitute principal, section soloist, and section double bassist with symphony orchestras across the northeastern United States, and has given countless performances with chamber groups across the region. He is currently Assistant Principal double bass with the Springfield Symphony Orchestra (MA) and beginning in September will serve as Principal double bass at the Norwalk Symphony Orchestra. Alex also substitutes with orchestras across the northeast, including the Northeastern Pennsylvania Philharmonic, the Connecticut Chamber Virtuosi, Connecticut Lyric Opera, and others. In the past, Alex has performed with the American Baroque Orchestra, Canton Symphony (OH), Erie Philharmonic, Southern Tier Symphony (NY), Orchard Park Symphony (NY), Western New York Chamber Orchestra, at the Norfolk Chamber Music Festival, and in classical chamber ensembles across the northeast. As a jazz musician, Alex has been an active freelancer. While in western New York, he regularly played with the best musicians in the area, including Carl Alenakian, John Bacon, Bruce Johnstone, Dave Schiavone, Eric Wills, Alan Zurcher, the Dave Stevens big band, and briefly ran the jazz series at Ellicottville Brew Pub West in Fredonia NY. Alex has performed in New York City and across Connecticut and Massachusetts with Tom Bergeron, Billy Cofrances, Robert Gottfried, Barry Ries, Doug Schlink, Pearl City Jazz Quintet, La Hot Jazz, the Connecticut Virtuosi jazz series, the David Harewood Quartet, and is currently a member of the award-winning Sarah LeMieux Quintet. In addition to his active performing career, Alex is an active music educator. 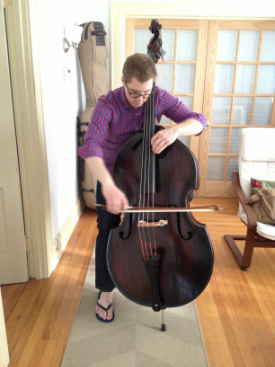 He teaches classical and jazz double bass as well as jazz theory, improvisation, and historical concepts. Alex has taught master classes and clinics in classical and jazz performance for double bass and mixed-instrument ensembles with Infinity Performing Arts and Signature Music Summer Camp, and independently. In 2016, Alex served as the Fellowship Director of the Vermont Mozart Festival for its inaugural season, and was integral in the design and implementation of the program and festival concerts while serving as the bass voice for the VMF quartet. While at Yale, Alex served as musical director for the Yale Tango Orchestra, a group that gave educational concerts at local schools teaching about Tango music, dance, culture and history. Alex plays on a Tyrolean instrument made c.1840 with an Arnold Schnitzer C extension. ​Arnold Schnitzer - luthier, Arnold made my extension. Jed Kriegel - luthier; Jed restored my Tyrolean bass. BassRosin.com - Nothing like fresh Pops!